Top 5 tips to healthy upgrade any recipe! - try my Summer Red-Pepper Dressing with some interesting ingredient upgrades. 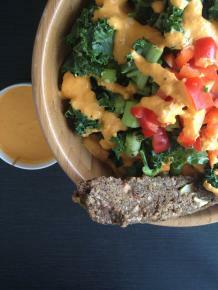 Summer Red Pepper Dressing - with a twist! yummy raw vegan onion bread...recipe in my upcoming online cooking course! As a raw-food chef, one of my favourite past times these days is to take any old recipe and raw-health upgrade it! I love the challenge and now I have a bag of tricks that will help you to do the same. The key thing for me is that I want healthy food to taste just as good, if not better, than its less healthy "cousin". So when I make raw-zucchini pasta with a creamy sweet basil pesto, it has to taste like that lazy summer afternoon in an Italian piazza in Rome, slurping on pasta and watching the world go by. If I make raw vegan sushi, it has to take me back to my Saturday afternoons sat at the conveyor belt at my favourite sushi bar in Omotesandō dori in Tokyo, again, watching the world go b y but Japan-style. If I whip-up Chinese noodles, replacing the traditional noodles with kelp noodles, you think my Chinese friends and family would eat them if they didn’t taste like the ones at yum cha….?? No, so, it has to be perfectly yummy! And, most importantly, if I make gooey, sticky raw-vegan chocolate fudge brownies, they simply must taste like the ones my grandma would hide in the back of her cupboard so I couldn’t reach them. Is it too much to ask that my food tastes and looks good, as well as being good for my health? So, as promised, here are my Top 5 Tips to upgrading any recipe. As a treat, I have given you a scrummy recipe all upgraded for you! I dare you to go away and upgrade your favourite recipe using these tips. My upcoming online healthy cooking and living course will be out in soon and contains heaps of tips like these, as well as more recipes, healthy tools, healthy upgrade advice and much more. To find out more, see my website www.graciouslygreen.com. 1. Upgrade sugar with plant-based sweeteners or coconut sugar – processed sugar is toxic and addictive, spiking insulin levels and rotting teeth. For me, there's no excuse to use processed sugar these days - there are so many healthier upgrades out there, it’s not even difficult! A middle ground and yummy swap would be a nutritious and low GI (glycemic index, a scale by which we measure the speed of the effect of the “sugar” on blood sugar - the lower the better, in short) coconut sugar such as Carazuc by Stephen James Organics. For diabetics or those really watching sugar-intake, an even lower GI alternative would be plant-based sweeteners, stevia or xylitol. Be warned, these are super sweet tasting, so go easy. I love xylitol in baking and stevia to sweeten drinks and smoothies. Try to choose the brown liquid stevia over the white powder as this is less processed. And, in case you’re wondering, no, I do not think agave nectar is an upgrade as it is basically a “High Fructose Syrup”. Although it has a relatively low GI number, it is highly impactful on blood sugar, causing insulin resistance as well as significantly raising triglycerides (a risk factor for heart disease). 2. Replace cornstarch and animal-based thickeners – the sad thing is that cornstarch is fairly processed and is also usually derived from a genetically modified corn. “GMO free” is an upgrade, but you can also swap to the mineral-rich algae thickeners such as agar in sauces, or Irish moss in things like raw-desserts. I also often use fibre-rich psyllium seed husks to thicken raw soups, sauces and even smoothies. If you’re looking to transition to a more plant-based diet, replacing egg and animal-based thickeners with these options is an easy swap. 3. Replace salt with mineral salt – I have about as much love for processed salt as I do processed sugar – so none at all. Processed salt robs us of precious minerals at the same time as dehydrating our body. Refined means the naturally occurring complex of nutrients is stripped from the orgional salt. What you’re left with is a toxic chemical that only resembles natural salt in its taste and texture. Common table salt literally imbalances the minerals in your body because it is only made up of sodium. High mineral salts, such of pink Himalayan salt, grey slat, Celtic salt and sea salt are full of minerals and actually help to hydrate you this way! Add a pinch to your water with a squeeze of lemon after your workout and you have the perfect hydration drink without all of that toxic sugar they put in the sports drinks (which, by the way, are the opposite of healthy). 4. Replace soy sauce with Tamari sauce – ah...the problem with soy…well, the entire debate is worth another blog post but for our purposes here just know, while most soy sauces are made with about 50% soybeans and 50% wheat, Tamari soy sauce is made from soybeans with just a touch of wheat or no wheat at all. In fact, you can buy a Tamari gluten free soy sauce which is naturally brewed with 100% soybeans and no wheat. This sauce also contains no artificial preservatives or MSG. Oh and bonus fact, San-J Tamari (the brand) is a non-GMO product – whoooop! 5. Upgrade standard greens to ORGANIC - and finally (for this blog post at least) UPGRADE YOUR GREENS! You all know how I feel about this subject by now, if you’re not an organic green leaf, berry or apple, you ain’t getting into my temple of health! Keep an eye on the dirty dozen and you can always trust Eat FRESH, organic e-greengrocery in Hong Kong for your yummy fresh and organic local produce. Sorry, I have to plug the brand again because I LOVE the products so much and so do our customers :0). - check out my suggested upgrades in action! Yield: 4 good-sized servings, will keep in an airtight jar for up to 6-7 days. 1 ½ cups of organic red-bell peppers – this is one which is heavily sprayed with pesticides, always seek organic with red peppers. ½ banana – whole fruit replacing sugar. Fructose in fruit is not harmful when it is with the whole fruit. However, when we extract fructose from the fruit in a high concentration, it becomes high fructose syrup. In this recipe, the fruit also acts as a thickener! If you would like to know more about Mia – Raw Food Chef and Health Coach - follow Graciously Green on Facebook here.